With the Canadian federal election coming next year, it’s no surprise that politicians and pundits are flooding bookstores with new tomes. 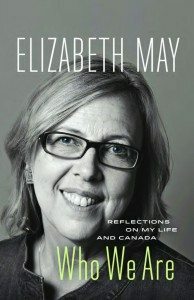 Into the fray steps Green Party leader Elizabeth May with a volume billed as a marriage between memoir and manifesto. From the title alone, readers should know to expect more of the latter, and sure enough, May goes well beyond the personal to delve into what she feels makes this country tick. On the memoir side, May opens with formative experiences such as her first encounter with Rachel Carson’s seminal book, Silent Spring; her family’s involvement with U.S. Democrats of the 1960s; and her move to Cape Breton, where her career as an environmentalist and lawyer began with a difficult campaign against pesticides. May’s political roots lie deep. By drawing a connection between the social action of her activist mother’s postwar generation and her own, May sets up the central section of her book, which succinctly and persuasively outlines the key issues facing Canada today: climate change, corporatism, our international reputation, the erosion of democracy, partisanship, and the abandonment of science. documented argument rings true, and her stridency lends the material urgency. The final section of Who We Are takes that urgency and calls it to action. The best political memoirs leave readers with a rallying cry, and this one is no exception. May calls for green technology, remaking Parliament as a means of combating voter apathy, and an end to partisanship. The Canada she envisions is filled with multilateralists and negotiators, science-based policy, and good government. For many, this may be not seem so radical, and it may be just the vision we need.